LA JOYA — The city’s police chief was terminated Friday via correspondence from City Manager Mike Alaniz. Former Chief Ramon Gonzalez, a 10-year veteran of the police department, said he was given no reason for his termination. He received a brief letter from Alaniz on Dec. 8 notifying him that his services were “no longer needed,” ending his two-year tenure effective immediately. Alaniz could not be reached for comment despite repeated attempts. 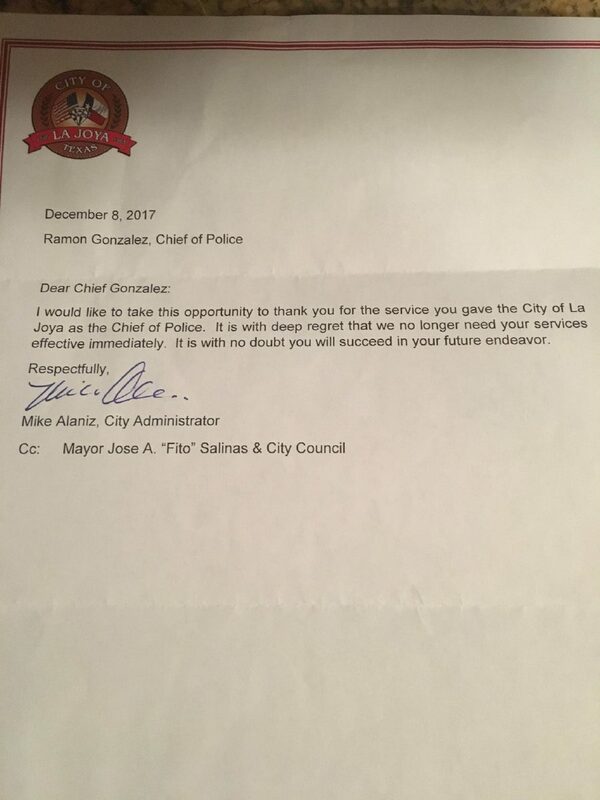 The letter firing Ramon Gonzalez as chief of police in La Joya. Gonzalez said he’d previously heard rumors that December was “going to be (his) last days.” He attributed the decision to “politics,” but would not elaborate. La Joya Mayor Jose “Fito” Salinas said it was the city manager’s decision to fire the chief. Addressing social media rumors, Gonzalez said an incident involving him setting off a firework inside the police department was a “prank” to wake up a dispatcher who had fallen asleep and was not the reason for his termination. What’s more, Gonzalez said the dispatcher in question did not file a complaint against him, nor was there a city investigation or any disciplinary action taken. “Yes it did happen (the firework incident), but it had nothing to do with this,” he said. Gonzalez speculated that his termination could be retaliation for his testimony in the recently settled “Autumn Renee” federal court case, which involves former police dispatcher Felipe Peralez, who was in a relationship with the mayor’s granddaughter. The plaintiff, “Autumn Renee,” sued the cities of La Joya and Peñitas as well as several La Joya Police Department officers in 2016 for allegedly failing to provide medical attention after Peralez sexually assaulted her in 2014 while she was in custody at the La Joya City Jail. Gonzalez said that he contacted The Texas Rangers to investigate the assault. No one has been appointed to replace Gonzalez, and two sergeants are assuming the chief’s responsibilities until that appointment is made.